Guava (Psidium guajava L.) is an evergreen shrub native to Central America with leaves containing large polyphenol content. At Bizen, we have succeeded in extracting and powderizing the polyphenols from guava leaves. We have also succeeded in concentrating the polyphenols in the guava leaf extract. Research has shown that, as for guava leaves, these products have various bioactivities. 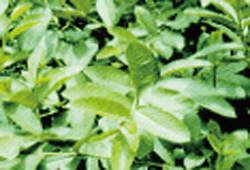 Guava Leaf Extract Powder(70% Polyfphenols) has been suggested to possess anti-inflammatory properties. In arthritis and dermatitis, inflammation is known to be caused by prostaglandins (PG) which are produced by cyclooxygenase (COX). At Bizen, our research indicates that Guava Leaf Extract Powder(70% Polyfphenols) inhibits the enzymatic activity of COX-1 and COX-2. In addition, administration of Guava Leaf Extract Powder(70% Polyfphenols) showed a tendency to greatly inhibit edema in experiments using adjuvant arthritis model rats. Animal research has also suggested that Guava Leaf Extract Powder(35% Polyfphenols) has anti-allergy properties. When Guava Leaf Extract Powder(35% Polyfphenols) is added to rat mast cells, it inhibits the secretion of histamine. Administration of Guava Leaf Extract Powder(35% Polyfphenols) significantly inhibited auricular edema in an atopic dermatitis mouse model. These results indicate that Guava Leaf Extract Powder(35% Polyfphenols) is effective against atopic dermatitis (a type 1 allergy). When skin is exposed to UV radiation, L-tyrosine is converted through a series of steps by tyrosinase to the pigment melanin in pigment cells. 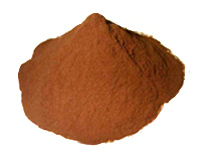 Guava Leaf Extract Powder(35% Polyfphenols) appears to inhibit the actions of tyrosinase. In a guinea pig UV exposure model, guinea pigs that received Guava Leaf Extract Powder(35% Polyfphenols) had significantly reduced numbers of dopa-positive cells in their epidermis. These results suggest that guava is effective in preventing sunburn. In addition to these effects, Guava Leaf Extract Powder(35% Polyfphenols) has also been shown to have anti-diabetic and antioxidant properties through research conducted at Bizen. If you would like more information, please contact us.